I havent done a 'Dare' for a few weeks, having been on holidays, so happily did this one tonight. I was in the mood to use my Gelly Roll pens ﻿, I like the way they flow smoothly and the colours are vibrant. I kept the colour scheme to Analogous or Harmonious, so the colours toned together well. 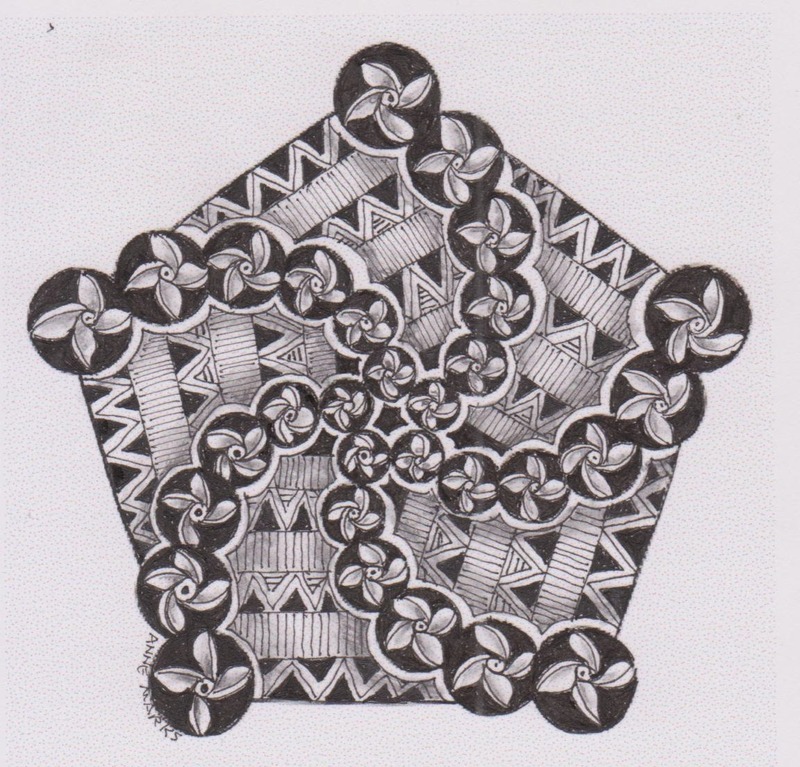 The thing thats missing is fine detail. Its not brilliant but I enjoyed doing it and thats the main thing hey? 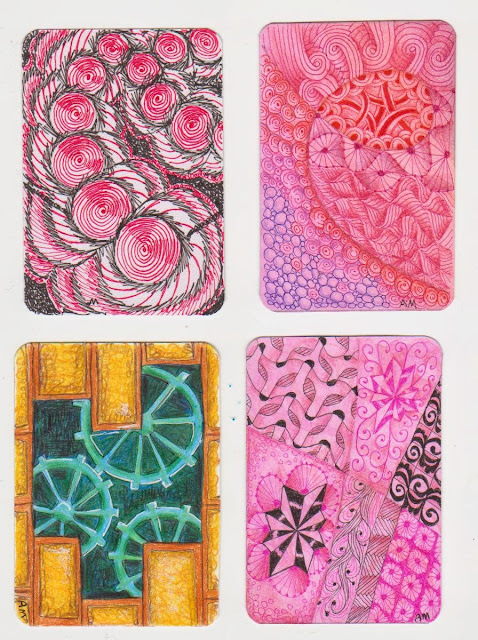 Ive had some fun playing with ATCs. Quite like the fact that they are smaller. I had some nice replies from last blog that a few folk will swap with me, but I'm not sure they realise I live in Autralia!! Thanks to them very much. indeed. For two of these I did a colour wash background first but found the linework didnt really stand out enough.﻿ This was for tangling. 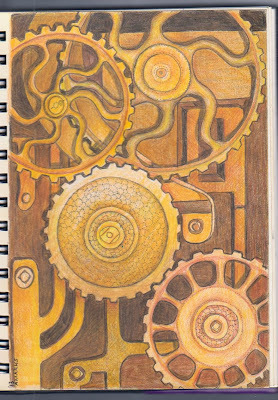 The cogs one I did with coloured pencil and the other using micron pens. 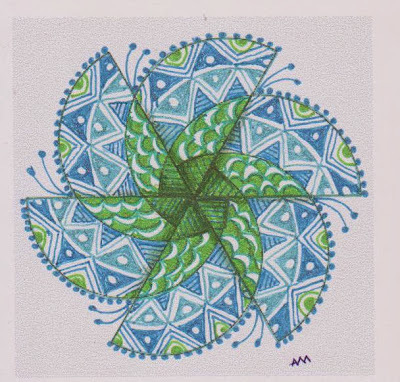 For the circular design I actually enlarged some zendala designs and printed them off to work on. The patterns were scattered over A4 card, then I cut them up into ATC size. Does anyone out there have an Apple Macbook or iPad who can help me to do my blog on? I have just switched from Windows to Apple and am finding the difference frustrating although I have quite fallen in love with my ipad mini. The problem I have found is getting my pictures onto the blog. I can write it ok but have yet to find a way to download my photos. ﻿Recently I became interested in Artist Trading Cards. They seemed a good size to swap cards with others who create artworks. So far I have yet to meet anyone else who wants to swap! However, I did this weeks challenge on an ATC, not brilliant but a start. 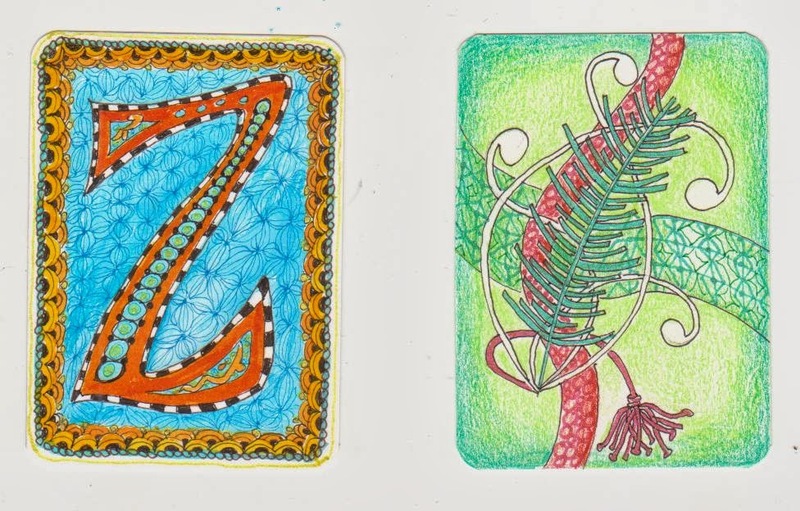 Then in my art group today I gave each a blank card to create something on. We used Maria's calligraphic 'Z' as a starting point. Each was amazingly different, vastly different to mine which still retained a resemblance. Sorry I don't have theirs to show you. Actually they weren't quite finished when they went home. 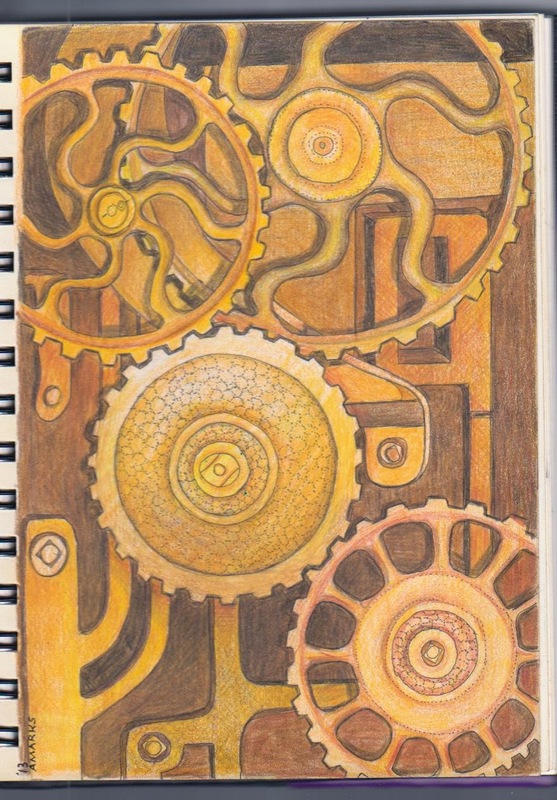 One day in my art class a lady produced an interesting print out of cog wheels. I knew I just had to recreate it!. It took some while to draw up, and just as long to colour over a series of nights. As my lovely Prismacolours have gone walkabout, I opened up my old box of Faber Castell Polychromos coloured pencils, which I haven't used in decades. It was an interesting experience. I decided to work in layers, and found them to be most co-operative to do so. It didn't matter how many layers I worked, I could always add another. I hope you enjoy my piece. I am working through a journal of 270 gsm paper size A5. Great stuff. Thought I'd work with traditional black and white for a change!! The two tangles I used for this zendala were "Well" and "Knase".Whilst "Well" takes time to do, I always enjoy using it.